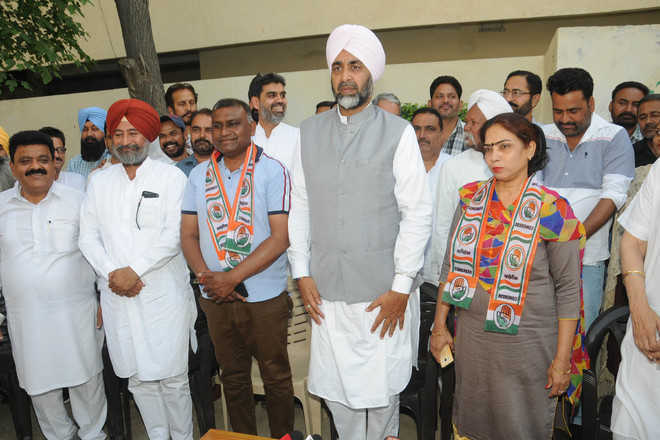 Independent councillor from Ward Number 23 Kamlesh Rani, who was supporting SAD, joined Congress in the presence of Finance Minister Manpreet Singh Badal at his office in the city on Friday. A major violation of the code of conduct was also witnessed in this function as the councillor’s husband Raj Mehra, who is an employee of the NFL, Bathinda unit, shared the stage with Manpreet and also took a siropa from him. While talking to mediapersons, Manpreet said “It is great that councillors and other workers associated with SAD, impressed by the work of the state government in the past two years, are joining the Congress party”. Replying to a query on the announcement of party candidate from Bathinda, Manpreet Badal said Congress has announced 11 candidates while announcement of two seats, Bathinda and Ferozepur, has been kept on the back burner. He further said that Congress decisions on party candidates were taken by the high command from Delhi so the delay was understood but why the delay in announcing Harsimrat’s candidature. When asked about his candidature from Bathinda, Manpreet claimed that he had told the party high command that he was working on brining Punjab’s economy back on its track. While much had been done, more was still needed to be done, he had told them. But now it was up to the party to decide and if commanded, he would contest. He also claimed that Chief Minister Capt Amarinder Singh and Sunil Jakhar were the ones who could tell when the party candidate would be announced. Pertinently, a large number of SAD-BJP and Independent councillors have joined the Congress in the recent past. Two days ago, SAD councillor Shinder Kaur, along with her husband former councillor Bant Singh Sidhu, had joined Congress.